You are here: Home » Chi-who-ly? Whether or not you’ve heard of Dale Chihuly, chances are you’ve seen his glorious glass sculptures somewhere. Along with museums, pieces are installed in libraries, hotels, hospitals, churches, department stores, and other locales in just about every U.S. state. We’ve had teaser glimpses of Chihuly’s work, viewing a couple of pieces here and there at the Monterey Bay Aquarium, the Rhode Island School of Design Museum in Providence, and other places. In St. Petersburg, Florida, we felt like we hit the mother lode when we happened upon the Chihuly Collection, a space devoted entirely to his work. What is so mesmerizing about his creations? They’re exquisite, imaginative, unique, and vibrant. Yes, that’s a lot of adjectives, and every single one is deserved. Chihuly has taken the ancient tradition of glass-blowing and put a modern spin on it, crafting series of works that draw inspiration from sources as varied as water and marine life, the art of Japanese Ikebana (flower arranging), and old Northwest Coast Indian baskets. The “Sunset Persian Wall” features exotic, spiraling forms in hues of red and orange. A 1,000-pound chandelier in varying shades of blue is made up of 400 individually crafted pieces. 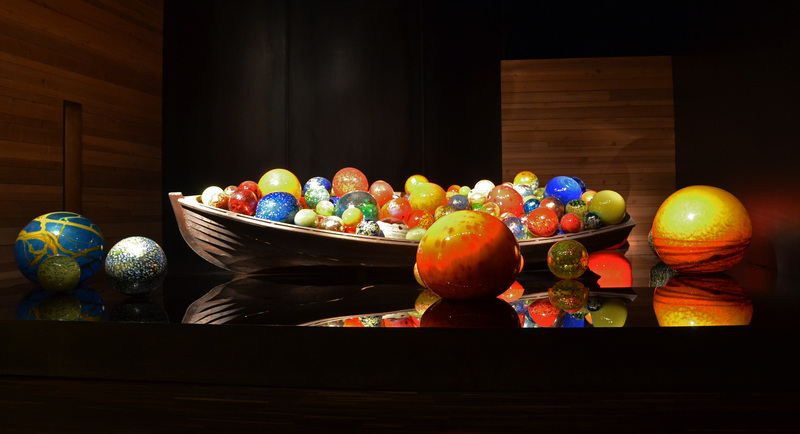 A boat filled with brightly-colored glass balls, reflected in a dark surface, evokes a Venetian canal at night (seen above). I can’t do justice to Chihuly’s creations by describing them. You need to see at least one for yourself. Click here for a list of places where his works can be found, both public installations and museum collections. The 70-year-old glass magician works with a team of artists in a Puget Sound-area studio. I’m hoping for an invite when the RV adventure takes us to Washington State.